From its very inception, this book of patient testimonials was crafted to give a voice to those who suffer from PNES. It was hoped that these voices would reach others who are similarly afflicted as well as family members, loved ones and health professionals. Because the testimonials included in the book came from across the USA and from around the world, the words expressed in it represent in a very interesting way the uniformity as well as the unique nature of PNES in different cultures, genders, locales, etc. Upon completing the book and reading through all 19 testimonials, I was struck with how profoundly moving they each and all are. However, rather than describing or reviewing the book myself, I will allow the four reviewers from the US and the UK who have posted their comments and their “5-star” reviews on-line so far to tell us their impression. A moving testimony from people who have suffered with PNES, My partner suffered with this condition and the ignorance and callousness of the medical community for many years. Our life suffered with misdiagnosis, wrong medications and a feeling of isolation. Too many people suffer with this condition and I hope these loving and sometimes painful stories help to bring awareness to this condition. The honesty in these stories cannot be escaped. Both the differences and the similarities in the first-person accounts of their experiences with this disorder are striking. My dear sister has struggled for so long, both with this conversion disorder and especially with the lack of understanding and compassion of many in the health professions. This collection of shared experiences has the potential to end the isolation that only adds to the pain of PNES. Thank you, Dr. Myers and Mary Martiros for an excellent resource – which is essentially a “support group in a book”. This is a timely book about a little-known condition, and one that is ill understood, particularly, it seems, by doctors, many of whom are inclined to dismiss it as ‘all in the head’. Although the disease has been recorded for centuries and was widely publicised by the work of Sigmund Freud and Martin Charcot in the 19th and early 20th century, it appears that the sufferers of today are often given a much rougher ride at the hands of medical profession than they were in the past. As with so many other illnesses, most of the literature on the subject has so far been written by doctors but recently increasing interest is being shown in the narratives of patients themselves, written from their own perspective and describing their lived experience. 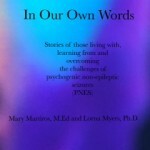 In Our Own Words is probably the first such book dealing with PNES. In it, sufferers describe not only the distress and unpleasantness of the symptoms themselves but also the devastating impact the illness can have on the rest of their lives in terms of employability and relationships. As for the accusations of ‘all in the head’ or ‘faking it’, no one who reads the personal accounts of the nineteen individuals included in this book would believe for a moment that they were inflicting it on themselves.